Sorry for not posting anything new in a while, but I’ve been rather busy in the real world. In short, the yeast isolation is still going on with some results. I have been able to purify some stuff from that berliner, but can’t tell for sure what exactly it is. More plating and testing is going to be done. I think I’ll use bromocresol green test to make sure. We’ll see when I get to it. The smell from the bag with the plates almost knocked me down with the smell of fruits and green apples so it seems like there is something useful there after all. My lab setup is now officially complete as of this week. I decided to get a better microscope but still have the same sucky camera. It does allow me to use a high power oil darkfield setup, which is pretty darn sweet, but the light source is not as strong as I’d like so with 100x objective the images are faint. I’ve also been playing around with some fancier microscope software. A “lab tour” will be posted next week as per a few requests. The plain berliner has been bottled and is happily conditioning now. It tasted pretty good for the first foray into sours before bottling and I popped a bottle last night because curiosity was just killing me. It’s not fully carbonated yet, but tastes mildly sour and funky with fruits and a touch of vinegar that’s barely noticeable. I saved about 250mL of slurry and will see what I can get from it because I’m starting to have some doubts as to how well the original blend survived. Here is a picture of some brett that I pulled off the pellicle right before bottling viewed under the new microscope at 1500X. And here is a sample I took from a vase with some flowers in darkfield. Don’t know what I’m looking at, but those worms, I guess, are lively and swim around really fast. I’m also going to isolate Brett. L from the “Old Ale Blend” mostly because I’m too cheap to spend $11 on pure culture, and it’s more fun that way anyway. Hope you find this more or less interesting or amusing so I can keep posting. Let me know if you have any suggestions. It looks like my homemade hood is complete! I decided to go with the velcro route rather than using screws or piano hinges because that simplifies the design and allows for the screen height adjustment such as raising it to block the top opening when not in use. Also when not in use there is another piece of plexiglass attaching to the bottom to keep it closed, though not completely. The light is just an aquarium light I had lying around. UPS truck came by today with the rest of the lab supplies, but no one was home so I don’t have them… Maybe tomorrow I’ll get lucky, but I doubt it. Ahhh the joys of postal service. Anyway, here is the picture. Tell me what you think. I finally started keeping a notebook and it is very helpful in keeping the thoughts together and not forgetting stuff. No problem in isolating the yeast from the bottle dregs I referred to previously. Straight WY Berliner Blend Plates: Number of colonies growing. Colonies seen are white and smooth, beige with rough center, and one yellow colony there as well. My guess is that the white ones are Saccharomyces, beige are Brettanomyces, and yellow is Pediococcus. This is strange since the blend is supposed to have Lactobacillus, which is probably there but it’s hard to tell apart from the yeast yet as they should be white colonies that later develop bluish centers. As far as I know Pediococcus is the one growing in yellow colonies. I inoculated some tubes with different colonies. Brettanomyces Isolate: streaked from a single beige colony on blend plate. Most of the colonies on the plate are white and medium sized (~3mm). 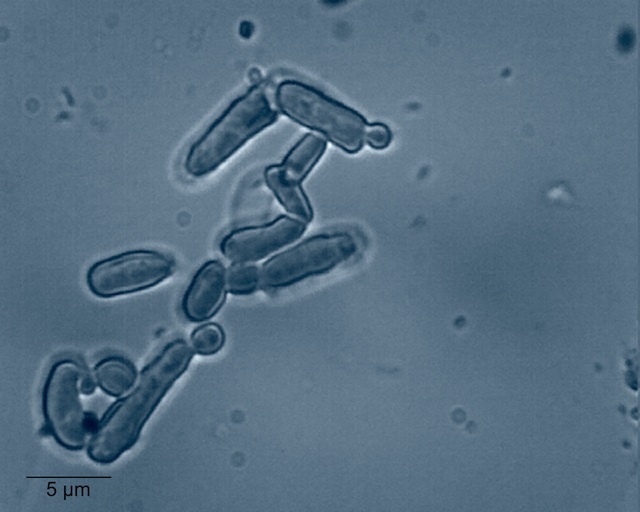 Large, ~10mm beige colonies with 2 morphologies seen – completely smooth, and rough in the center. Inoculated tubes with each. 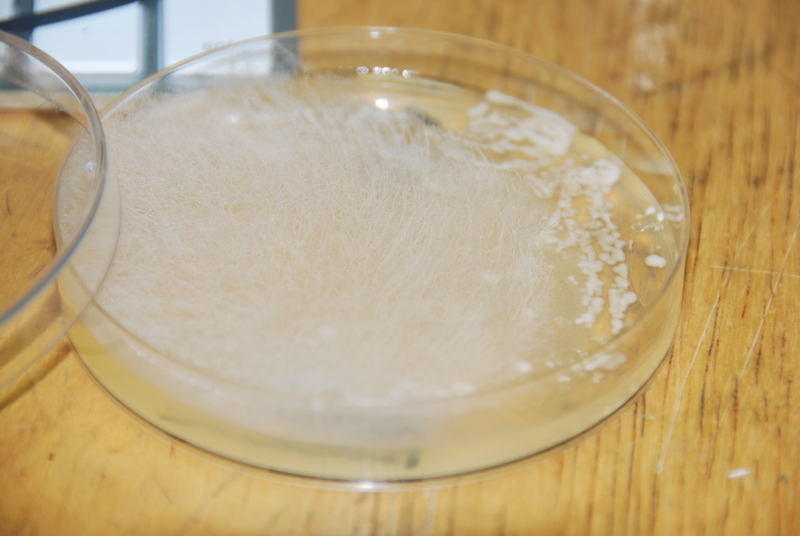 Saccharomyces Isolate: All white colonies. Pretty much looks like yeast always look. Inoculated a sample. 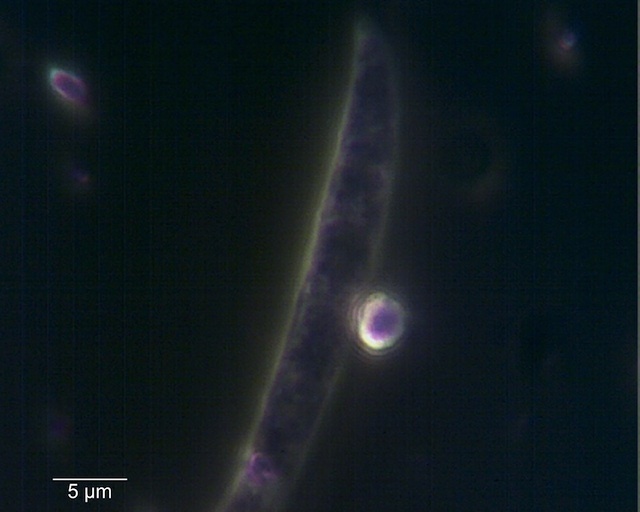 “Lacto Isolate”: streaked from a single small colony that I thought may be Lactobacillus. Interesting results. 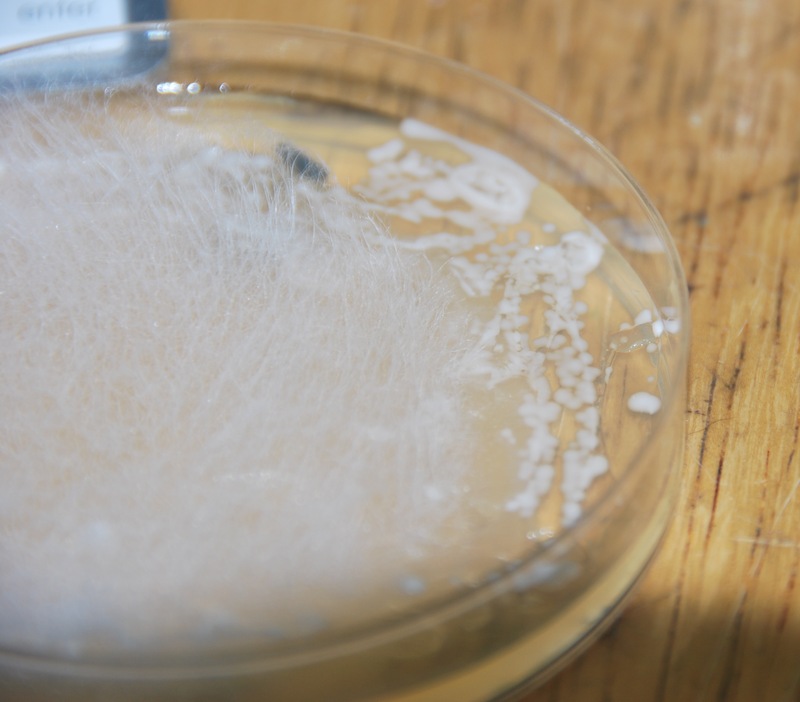 Most colonies are white and look like Saccharomyces. One yellow colony, one pink colony, and one beige colony seen on the same plate. No idea what they are just yet. Inoculated some tubes. 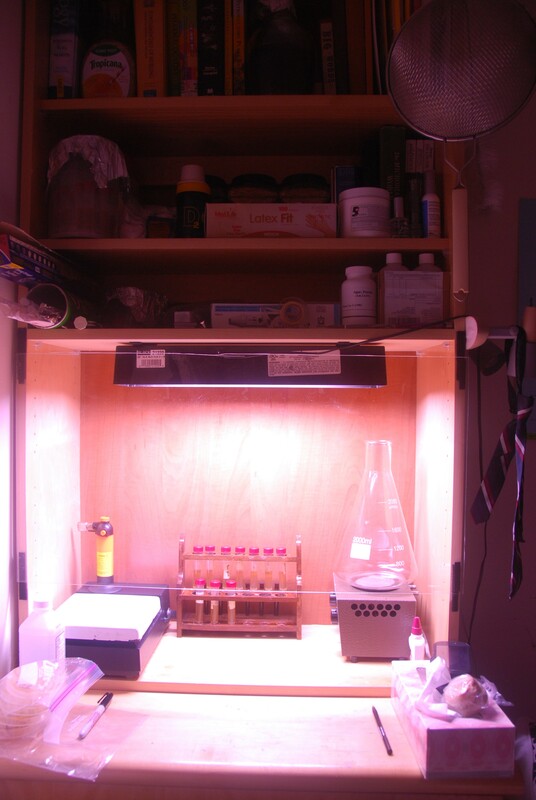 Once the cultures grow I’ll take samples and look under the microscope. Right now I’m sure that white and beige are Sacch and Brett respectively, but it’s interesting to see the difference between the rough vs smooth Brett as well as what the yellow and pink colonies are. Friday sounds like a good day to try doing that. Preparation of Medium: Dice potatoes and place in 500.0mL of boiling water for 30 min. Strain through cheesecloth. Adjust volume to 1.0L with distilled/deionized water. Mix thoroughly. Add agar. Gently heat and bring to boiling. Add 20.0g of glucose. Mix thoroughly. Distribute into tubes or flasks. Autoclave for 15 min at 15 psi pressure @ 121°C. Pour into sterile Petri dishes or leave in tubes. Use: For the cultivation and maintenance of numerous fungi such as Cephaleuros virescens. I modified the recipe a bit by adding sucrose (table sugar) instead of glucose to allow for Lactobacillus differentiation. Lacto grows as small colonies on other media, but sucrose allows it to form large colonies due to some complex formation that I don’t remember off the top of my head. So the plan is to seed a mixed culture such as that Berliner I’m currently playing with, or a culture from grain, or Cascade dregs (their Lacto strain is a damn monster based on how sour the beers come out) on Malt or something else, pick out small colonies and streak on PS plates. Unless my books are wrong, Lacto colonies will get big. Another route would be transfer the entire plate onto a filter/membrane/paper, transfer onto a PS plate and compare the growth. I also read that this medium is very good for mold growing and boy were they right! Mold contamination is not that uncommon, but it takes a while for it to grow out to be a problem. By then you’ve grown whatever you need and you don’t care about the mold. It appears that this is indeed an ideal mold growing medium. I have never seen such rapid growth. Never! It’s just so cool that I’m not even mad about the plate being all but useless now. Another good piece of news is that all four plates grew colonies and I started further propagation – transferring individual colonies to their own plates. The Berliner (from the original WY pack) plates seem to have colonies with 4 different morphologies. Flat smooth-edge white colonies (Saccharomyces I think), round smooth-edge beige colonies (could be Brett), rough-edge round white colonies (could be Brett), and pin-prick white colonies (could be Lactobacillus). According to WY there should only be 3 organisms there so what I see on the plates in terms of smooth vs rough/white vs off-white is probably due to agar scratching. Also it looks like the other plates from that batch turned out fine. The agar is nice and firm so it must have been the uneven mixing or something else… don’t see how though, because I made sure I mixed it well to avoid this problem. Hmmm… Regardless, the experiment goes on! Here is a photo of the really moldy plate. Appreciate the beauty of the mold! Seriously, I find mold to be just fascinating. I even looked into getting a Mycology degree, but there aren’t any in NYC so I ended up in Molecular Bio instead and I don’t regret it. Appreciate the mold! As you can see, the colonies also grew out nicely but got overgrown. That much mold in 48 hours is just amazing. It's also amazing that a 7 month old culture grew so quickly.